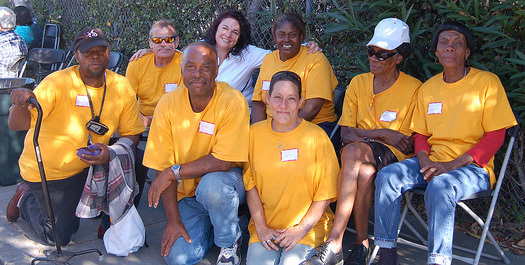 One of the bright lights in support to homeless people is the Downtown Streets Team in Palo Alto wherein homeless individuals are trained, hired, and supervised to clean the public streets. The program was established in 2005 and now has served over 200 homeless persons, who have graduated to employment and greater stability. Bill Somerville spent a day at the program which is directly across the street from the Stanford campus. His purpose was to explore more housing for the homeless. He brought with him Larry Purcell of the Catholic Worker Program in Redwood City. A lot of what the Philanthropic Ventures Foundation does is to introduce various programs to each other and play a role in making partnership possible. The Downtown Streets Team is being adapted by other cities. In San Jose the Environmental Protection Agency has funded a program to clean up the creek beds where, as irony would have it, a lot of homeless people live. Some of these people are now being placed in housing. PVF believes you first find outstanding people because they are what make good programs work. In the case of the Downtown Streets Team it is Eileen Richardson, a woman with a business background, who created and now runs the program. This entry was posted in Uncategorized and tagged homelessness, Palo Alto, poverty, Where's Bill. Bookmark the permalink.